This world map cross stitch kit contains everything you need to stitch an extra large size world map, with the borders around each of the countries. 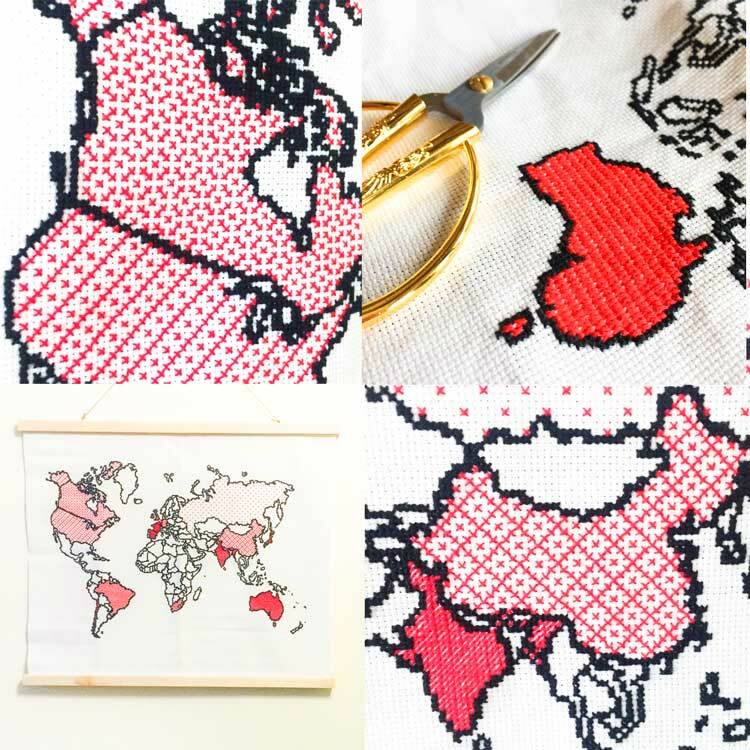 You can use the world map cross stitch kit as a fun way to show where you’ve been traveling. You can stitch the outlines and then fill the countries as you continue to travel. The patttern will show the cross stitches you need to make for the country outlines. And you can then use your favorite embroidery stitches to fill the different countries. You can choose between a kit with just the black floss to make the country outlines, or a kit that will contain 24 skeins of floss in different colors. Furthermore you can choose between a kit with Aida 18 fabric or Evenweave 28. With the Aida 18 fabric your piece will be around 16 2/3″ x 11 1/3″ (~ 42,5 x 29 cm) large. With Evenweave 28 your piece will be 10 11/16″ x 7 5/16″ (~ 27 x 18,5 cm) large. If you’re a beginner stitcher it will be easier to stitch on Evenweave. You can fill the countries with different patterns, on this blog you’ll find 10 free filling cross stitch patterns. The pattern includes light blue stitches for the main seas, oceans and lakes. We’ve added those to help you distinguish the country map outlines. You don’t have to stitch them to get a beautiful result. But of course you can always choose to stitch them anyway. When you choose for the kit with 24 skeins we will include sufficient blue floss. This pattern is at intermediate level as it is much larger than most of our other patterns. The stitches for the map outlines are really easy – it’s just the cross stitch. 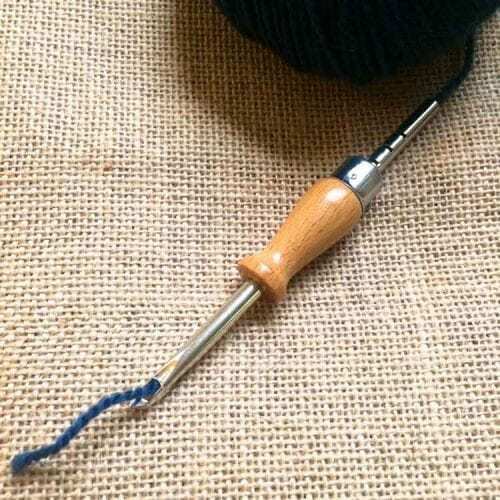 And then you can fill it with any other stitch you’re familiar with. 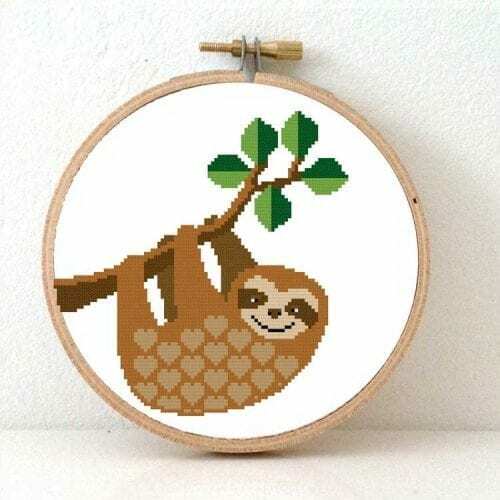 The pattern does expect that you know how to stitch the cross stitch. We have included our best tips on embroidery. Great! Arrived much sooner than expected. Thank you. I’m sure my friend will love it! I love how it looks on my wall! thanks so much for the design! I ordered this on backorder as they were out of stock, received it after a few weeks and very happy with it! Love Love Love Love Love it! Easy to follow pattern and stunning result! Love the design! filled it will all different colors and pops from the wall! Cross Stitch Kit X-ray technician. Gift for x-ray expert. DIY New job gift. Embroidery kit including hoop.